On this edition of the Nixon Now Podcast, we’re in studio with special assistant to President Nixon, and business and civil rights leader Robert J. Brown. Jonathan Movroydis: Welcome to the “Nixon Now Podcast.” I’m Jonathan Movroydis. This is brought to you by the Nixon Foundation. We’re broadcasting from the Richard Nixon Presidential Library in Yorba Linda, California. You can follow us on Twitter @nixonfoundation or at nixonfoundation.org. We’re in studio today with Robert J. Brown. He is a Nixon Foundation Board Director and owner of B&C International, the oldest and most respected minority-owned global strategy and business consulting firm in the United States. 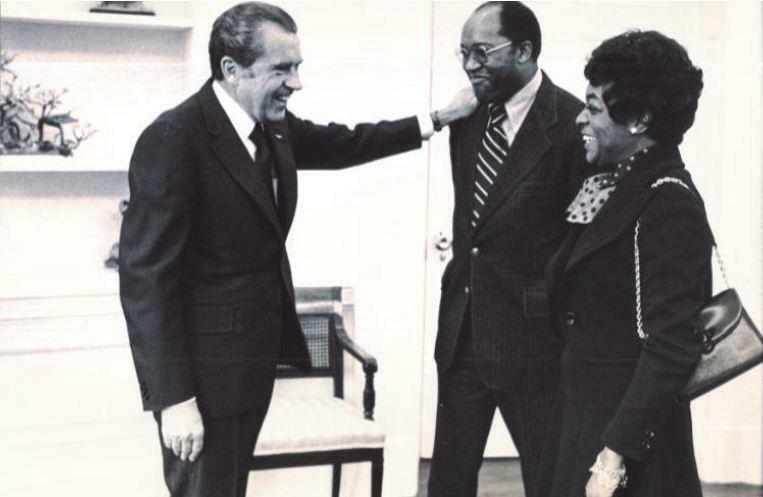 Mr. Brown served in the Nixon’s the White House as a special assistant to the President. He’s created for starting and developing the U.S minority enterprise program and the Black College program created through executive order by President Nixon. 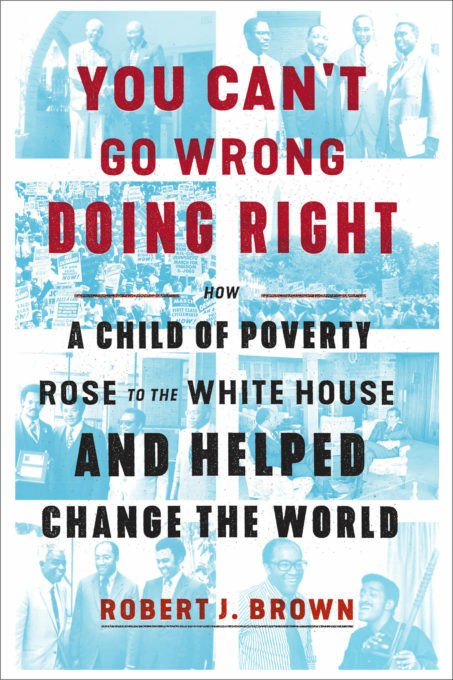 Hiss remarkable life is chronicled in his new memoir just out, “You Can’t Go Wrong Doing Right: How a Child of Poverty Rose to the White House and Helped Change the World.” Mr. Brown, welcome. Robert J. Brown: Thank you very much. Jonathan Movroydis: Let’s start with the title of the book, “You Can’t Go Wrong Doing Right.” Why this title? Robert J. Brown: Well, the reason for this title is that it’s something my grandmother who raised me who was the daughter of a slave in eastern North Carolina, she used to tell me all the time, we were poor and, you know, didn’t have very much, but she was a very Christian woman and she used to tell me all the time from the time I was a little boy, she said, “Bobby, do the right thing because you can never do wrong doing right. You can’t go wrong.” And over and over again, when I went to school, when I went to church, she would tell me, you know, “You have to do the right thing.” When I went to college, when I went to work as a policeman, when I went to the White House, when I went on the boards of directors of the largest companies in the world, that’s what my grandmother would tell me. She would just keep on telling me that, and I believed her. And it works. My experience has told me over and over again that it works. Jonathan Movroydis: And where did you grow up? Robert J. Brown: I grew up in High Point, North Carolina where I still live today. I’ve lived and had homes many places across the world. But the place where I call home and where I’ve always lived no matter what I had or what I was doing, my home was in High Point, North Carolina. Jonathan Movroydis: The title of your first chapter is “You Don’t Have to be Rich to Give.” And you say in your book, in the title, that you were a child of poverty. What did you mean by that? What do you mean by that, you don’t have to be rich to give? Robert J. Brown: Well, again, it comes from my raising. We were poor. I mean, we raised hogs and pigs and my grandmother canned. She would get everything and can it. She canned food out of the garden. She’d can the grapes and make jelly out of them. She canned the peaches off the trees, and we raised chickens. And that’s the way we lived. And it was not bad but it was poor. It was difficult many times. So that’s the way I grew up. Jonathan Movroydis: You write that in High Point, North Carolina was no different than other southern towns. Racism and discrimination were a part of life. And you came of age during the whole “Brown v. Board of Education.” I think you were 19 years old at the time, 18 or 19. This is also at the onset of the early civil rights movement. How did this era, how did this civil rights movement, especially the early times and also the tensions within the South during this period of time, how did this impact your life and career? Robert J. Brown: Well, it impacted me in many ways. First of all, you know, we couldn’t go to a restaurant. I couldn’t go to a restaurant and buy food. There were all kinds of restrictions many times on where you could go or what you could do. There were many places, theaters for instance, many of them would not sell a black a ticket and you’d dare not go there, lest they call the police and put you in jail. You couldn’t go in to…many of the drive-in restaurants, you couldn’t go to. I’ve been arrested during that time. I was in business. I had come back home and set up my business and I was arrested on several occasions just trying to get something to eat. And I know on one occasion my late wife and I were arrested together along with several other people and they took us to the jailhouse, the jailhouse where my first job was a policeman in High Point. In a jail that I had been putting people in, my wife and I ended up in that jailhouse. So that wad difficult. But then I got to know a number of people like Dr. Ralph Abernathy and Dr. Martin Luther King Jr. and Reverend B. Elton Cox and Jim Farmer and just a number of other civil rights people, and my uncle was a preacher and a civil rights person, and so I got to know them and know what they were trying to do. So I tried to be helpful in many ways to them. Not going to jail. I decided I wasn’t going to jail back and forth. Jonathan Movroydis: Was there a particular civil rights leader that had an impact on you philosophically? Robert J. Brown: I think the civil rights leader that had the most impact on me was Martin Luther King, Jr. He became a close friend and I served on his board, his executive committee. I traveled with him, and he was a wonderful man. And Reverend Abernathy was a great guy, and he had others. Reverend Joe Lowery was another one and Reverend Andy Young. He was a tremendous person during the civil rights movement. Reverend Otis Moss who is retired now in Cleveland, Ohio. They were all warriors. They went to jail. They would do whatever was necessary, legally and above board, to free our people. And they are some of the great heroes of our time. Jonathan Movroydis: You had mentioned working with Dr. King. How were you recruited to work in the civil rights movement? Were you recruited or was it just, one day, were you just inspired to work on civil rights? Robert J. Brown: Well, I was motivated and I’d always…I would get money out, I would try to be helpful with money and whatever else. But one day I’m in Atlanta, Georgia with Reverend Wyatt Tee Walker, who was the big warrior and who ran the Southern Christian Leadership Conference for Dr. King. And I met him and he said, “Bob, have you ever met Dr. King?” I said, “No, I haven’t met him.” He said, “Come on by our office. He’s there today and I want you to meet him because we need your help.” So I went there and I met him. We chatted for a while and he said, “Look, we need your help.” He said, you know, “We can’t carry on because we don’t have money, our contacts are limited. And a person like you who’s in business now could help us immeasurably.” And so I took it from there. And from day one, I started raising money for him. I started working in other arenas for them and helping him get people out of jail, and just all kinds of things like that. And then I introduced a new concept to a lot of top businesses in America who didn’t understand the dynamics of what was going on. The Woolworth Company became one of my biggest clients. I serviced the A&P stores. I’m talking about through their headquarters with the chairman of the board. That’s who I deal with, and their board of directors. And there were other companies like that that I worked with. And I got those companies to give me the wherewithal and to the flexibility to be helpful in various kind of instances. Because when they wanted to have a meeting somewhere or something, they didn’t have enough money to rent the hotels and other kinds of things. So I would do that and then I would charge the company for it. And then other times the company would want to know how they can do some good things and I would try to work through the civil rights groups to do that. There were all kinds of things that happened over and over again. Jonathan Movroydis: Can you tell us a little bit about the integration of the lunch counters at Woolworths and your work on that? Robert J. Brown: Well, it started just as I was about to go into business in Greensboro, North Carolina, the area where I’m from. I’m from High Point which is 10 miles away. And the young people who started it had a mission. And their mission was to make America a better place for everybody to live and make everything available to all American citizens no matter what their color was. And so I wanted to try to be helpful in some kind of way. And that was one of the basic reasons that I started my business because there was nobody in the kind of business that I was in, in America or nowhere else I don’t think. And I thought I could use what I had and the contacts that I could make to bring America together, to bring businesses together with blacks and where blacks would have more opportunities across the board to serve at every level: on the board, in corporate suites, and everything else. And then they could help revitalize our communities all over. Jonathan Movroydis: Next question, crossing the political divide, you were you were recruited to work in the Nixon administration. What did the White House want you to do? And how were you recruited? Robert J. Brown: Well, I have worked for Democrats and Republicans and I had been working as Director of Information. When I quit my job as a federal agent in New York, the Kennedy administration, Bobby Kennedy, recruited me to be Director of Information research for the young Democrats in New York in Jack Kennedy’s campaign. I did that for a number of weeks and then he won. I had met Bobby Kennedy when I was a federal agent and Bobby Kennedy was the chief counsel for the Senate Rackets Committee. And he was working on the mafia and all that which I was working on also. And he remembered… I had seen him at different functions. I saw him at Martin Luther King Junior’s funeral and the night before he was in my suite in Atlanta and he asked me to help him and that’s what I did. But two, three months later, he’s killed. And then I saw some of my Republican friends who I wanted me to work for Richard Nixon who I had never met and didn’t know. So they convinced me that I should work with him. So I did and helped in a lot of different ways. And then one day they asked me if I would do a special project for them, that Mr. Nixon was going to go into Ohio, in a town in Ohio where…in upstate New York where Mr. Humphrey tried to get in and he couldn’t get in because the demonstrator wouldn’t let him. He got back on this plane and left. Well, Mr. Nixon was supposed to go there a week later, and they wanted to see if it could be cleared out where he could go in. And they knew that if Humphrey couldn’t get in, they knew that they wouldn’t let Nixon in. And so they sent me there to clear the way and that’s what I did. I worked it out where Mr. Nixon got into town, made his speech and went back to the airport, had a fundraiser. The demonstrators were on the side of the road but they never blocked him. And I worked that out that way and then he wanted to know from Bob Finch who worked this out, and they told him that I did and he told me to get me on this plane because he wanted me to travel with him everywhere he went until the end of the campaign. And that’s how I got to know him. Jonathan Movroydis: Democratic leaders like Lyndon Johnson are known for their legacy on civil rights. When you met Richard Nixon, did you think he was particularly passionate about civil rights issues? Robert J. Brown: Yes, I thought he was a man who kept his word and who wanted to do the right thing. That’s what impressed me about him. And we would have a chance to chat just briefly here and there because there was so much going on and he’s busy on the campaign in plane and all of that and meeting with the…handing out press releases, working with Ron Ziegler, working with Haldeman and everybody else, Bob Finch. So it was hard. But, you know, he would say hello to me and shake my hand, “Thank you for this,” and, “Thank you for doing this and that and the other,” but we never had any serious conversation until the campaign was over. So I went to the hotel, The Pierre Hotel where he had his suites and the campaign was set up. And when I got there, Haldeman took me up to see the President and he was meeting with Herbert Brownell and Bill Rogers. And we went in and Haldeman said, “We’ll wait until you’re finished.” He says, “Oh, no, no, no. Bob Brown, you come on in here. I got to talk to you.” So he introduced me to Rogers and Brownell. But the way he introduced me, he said, “This is Bob Brown and he’s gonna be one of my top assistants in the White House.” Now we hadn’t even discussed it. In fact, I had told Haldeman and everybody that I didn’t want a job, that I wanted to be in my business. I’d be a consultant. I’ll do whatever they need me to do but I don’t need a job. I need to go back and make some money. And that killed that right there. And then he put everybody out including Haldeman and then for the next hour and a half we stayed in that suite and talked about what he wanted to achieve in the administration, where he had been, he told me about his life, and he asked me to come in and help him. He felt that I could do that. And so I did. And I said, “But I will do whatever you want me to do. If you want me to do some projects or whatever, I will do that but I have to go.” Then he said, “You ought to take an ambassadorship for six months. So everybody for the rest of your life everybody will call you Ambassador.” But I said, “No.” He said, “Well, you keep your White House pass and everything else because you’ll be coming back.” And he said, “You name whoever you want to take your job because you’ll be coming back and you let them know you’ll still be reporting to me.” And so that’s what happened. We remained friends and I tried to be helpful to him until the day he passed away. He was friend. I knew that. Jonathan Movroydis: Shortly after you came on staff, President Nixon signed an executive order empowering minority enterprise and black college programs. Could you tell us a little bit about that? Robert J. Brown: Well, those were two different programs. One was in the area of education. The other was opening up opportunities for minorities in business, particular business with government agencies. We figured that the U.S. government belonged to everybody and it made no difference what their color was or what their station in life and that everybody ought to have a chance at government business. And so we wanted to do that, and we wanted everybody to understand that we were serious about it and we would put the muscle and power on the President of the United States behind it. And that’s what we did. And that’s why that was done. And in the other initiatives going forward, we had the same kind of feeling, that they were important, that we needed to do it, and let’s go get it done. Not just put something on paper and you don’t do anything. That’s what happens to many times in government. You write a memo or a law gets on the books and nobody ever hears anything from it until way later on, maybe 20 years or something. And we didn’t want that to happen to any of the things that we were dealing with. Jonathan Movroydis: Could you tell us a little bit about the impact of these policies, both in the short-term and the long-term? Specifically, how do you measure whether minority businesses are having great effect in America, whether, you know, black unemployment has gone down and more blacks going into colleges? Did it have that sort of impact right away or did it take some time to take hold? Robert J. Brown: Well, it had some immediate impact because we could tell in terms of the enrollment at various universities, looking at what was happening and whether enrollment was going up. New students were coming in because of the opportunities that we had proposed and put into record book. And so it had an immediate effect. And the schools and the people in the country, you would go to different communities all over America, and they were very excited about all of this. They were very excited. And that’s what happens. In many instances, some of us get to be a little bit above the poverty stage and think that we have it made, but the little people, the people who carry on a day-to-day basis in their jobs and everything else, they’re working all the time trying to make a better life for themselves and their children. And that’s what we were concerned about. We were concerned that we want to do whatever blockage, whatever doors that were up, we wanted to tear them down. And in some instances, I used to tell people I just want to burn them down, tear them down, bomb them down, whatever. No blockages. We’re all Americans and we all need to be doing the right thing, and the right thing is to try to open up opportunities for everybody, black, brown, white, blue, green, rich, poor, whatever. And that’s what we were trying to do. Jonathan Movroydis: Could you tell us a little bit about the direction that the Nixon administration generally wanted to take on civil rights? You say you want to do the right thing and that this wasn’t necessarily a political move that the President just wanted to go into the direction of opening up more opportunities for people. Could you tell us a little bit about the President’s general philosophy on civil rights? Robert J. Brown: Well, first of all, I felt and I’ve always felt very strongly that it’s the right of every American to have…if one person or one group over here has all the jobs and all the opportunities, that’s a big problem. That’s not civil rights. We have to clean that up. That’s just as important as anything else because you got to live, you got to eat, you got families, and all of that. You got children. Everybody needs to have an equal opportunity. Now, if you don’t do it because you’re lazy or you’re sorry or you don’t want to do it, fine. No problem. But the opportunity is here. This is America and we’re supposed to be working at that, to open it up. That’s part of our civil right to do that. And whoever is in the White House or any house, the State House or the City House ought to be pushing that and making sure that there’s equal opportunity for everybody and we believe that. And so we worked at it day in and day out, year in and year out. And it’s what I believe and I think what President Nixon believed, that whatever opportunities out there ought to be opened to everybody irregardless of whether you’re poor, rich, white, black, blue, green, you know, Hispanic, Jewish, or whoever. Jonathan Movroydis: One of the little-known accomplishments of the Nixon administration was the desegregation of the schools in the South. Could you take us through that process and how the Nixon administration significantly desegregated southern schools? Robert J. Brown: Well, the Supreme Court’s order for the second time came down and when it came down, the order was that all schools should be desegregated immediately. And they had first issued the order in 1954. That was the year I graduated from high school. And here it was 1970 or ’71, and the schools were still segregated, from ’54 to ’71. I would say that that’s a reasonable length of time or more than reasonable. And so the Supreme Court said no more this dilly-dallying and subterfuge and all this. All people should have the chance to have an equal opportunity to go to any school they want to go to because it’s being paid for with taxpayer money. And this is America and this is what we’re doing. This is what we’re changing and we go with this. And so we were given a certain length of time that all the schools should be integrated by this fall, by that fall of I think it was 1971 or 1970. And we had to go to work to make sure that the Supreme Court’s order was carried out. Now, a lot of people and newspapers and media were saying that, “Oh, that’s not gonna happen under the Nixon administration because they’re going in another direction.” But President Nixon said, “We’re going to carry out the Supreme Court’s order because this is America and hey, the Supreme Court, the highest court in the land has given an order, we going to carry it out.” And so we set out to do that. My office was handling a great deal of it. And the President set up a special working group within the White House chaired by Secretary George Shultz and with a number of people on it including the Attorney General of United States and myself and about six or seven others. And we were told by the President himself what he wanted, and what he wanted is that the Supreme Court’s order taken down the road and didn’t want any violence. We wanted to accomplish what they wanted to accomplish and what we wanted to accomplish and integrate all the schools without violence. So we went around, a special group, around America and the South in particular and to people who had a definite interest, who owned the big factories, who owned the big companies, who employed thousands of people, and we told them what the President wanted, that he wanted the schools integrated and that we didn’t want no problems. And if there was a problem, we would take every step to stamp it out with troops, with whatever we needed to do. And we didn’t feel like anybody could stand up against that. So we went around to all of the most powerful people in those states where the schools were supposed to be integrated and talked to them. And when we set up groups of those people in those states, that would come to Washington to meet with the President himself, so the President himself could tell them. And we had every one of them come to Washington and every group the President met with and told them what his desires were and what he was going to do. If there was violence, he told them that he was going to stamp it out in every way he knew how to stamp it out. And he thought he had the necessary forces to do it. And if they wanted to go forward, he said he would try to lift them up and helped him and do whatever is necessary to keep this country on the right path so there would be no violence. And when the day came that all the schools were supposed to be integrated, when those kids went to school that fall, we didn’t have one incident in any of those eight states. Not one incident. Not one. Jonathan Movroydis: This was 16 or 17 years after the “Brown v. Board of Education” decision by the Supreme Court. What do you think Richard Nixon was able to do this while his predecessors were not? Robert J. Brown: Well, Richard Nixon was a special kind of human being. And when he talked and he wanted something done, there was nobody playing. We didn’t play games in the Nixon years. And I think people knew that he meant what he said, particularly a lot of the top people that we met with. We met with all the top people who owned the biggest businesses in those states, who had the power to do what needed to be done. We met with all of them. And they knew that we meant business. They knew that the President meant business because he was that kind of man. And so everybody wanted to jump on board because they didn’t want to be caught weighed in the balance and found wanting. Nobody wanted that, so everybody cooperated fully, 100%. And when the schools were integrated, the day that they were integrated, there were papers and media saying that there was going to be violence, there may be some killings and all that. There was not one incident, not one person was arrested, not one person came to the table with a lot of violence. And that was the Ku Klux Klan or anybody else. Because if the Ku Klux Klan or some of those kind of folks had stepped up to the plate, to the table, and tried to force their way in and start some violence, we would have stamp them out. We were in a position where we had the army, everybody, waiting and ready to stamp out any kind of violence from Ku Klux Klan and everybody else. And everybody knew that. We made sure that the word got out to them that if you show up on this day dealing with this, and here’s what’s supposed to be happening, no. Never gonna do that. And I think that’s the way the government ought to be run all the time. You know, we need leadership that stands up to the table and say, “Hey, look, we’re going to do the right thing and let’s stand behind it.” That’s what President Nixon was all about. You didn’t have a lot of people up there crossing him because they knew that he would going to stand tall. Jonathan Movroydis: In some ways government is a reflection of the society. One of the challenges that the Nixon administration had was advancing blacks and other minorities into government positions and in the military as well. You were a part of that. Could you tell us a little bit about that as well? Robert J. Brown: Well, we had a lot of programs. And when we came to the table, when we took over the White House and the administration, there were a lot of things in place on paper that said, “You know, equal opportunity and this and that and the other, not only in the schools and in the government but all kinds of everything else, and they had a lot of laws that they’d passed. But that being…and get being working, in fact, in these different agencies of the government and other entities, it wasn’t working that well. Because the numbers didn’t show up. And I’m talking about the numbers of people who had been relegated to the lowest level and the lowest jobs and everything else, they were still there. So we felt like we needed to do something about it. And so I was the person who monitored all of this kind of thing. And I was the person who most of the time would take the message to whoever it was that we needed to take the message to and to monitor them, to let them know that, “Hey, look, you’re not doing the right thing and you’re not stepping up to the table to do what the law says that you ought to be doing. You shucking and jiving. And we’re not going to have this in this administration. Now, if you want to stay there and try to do the right thing, fine. We’ll be supportive. But if you want to just jive around and act like you’re doing something, and nothing is happening, you’re out of here.” And that’s the way we ran the White House and the administration. The record is very clear on how many people who were supposed to be there weren’t there because we didn’t need them to show up anymore. So, I mean, it’s just that if you’re serious about something, if you’re running a business, I don’t care what kind of business you’re running, whether it’s the federal government or whether you got a factory out here making widgets, you got to run that where it’s going to be successful. You got to tell people what you want to do and be good to them and support them and everything else. But you got to draw the line because in the end it’s all going to be laid to your feet or to whoever’s feet and say that we accomplished X number of things. Now, if you went there and you spent 2 years, 3 years, 5 years, 15 years and, you know, you’re just jiving, you didn’t accomplish anything, then you’re a failure whether it was 2 days, 2 weeks, 2 months, whatever. And we were not going to stand for that. And since that was one of my charges, you know, I brought lots of people into the White House. I showed up at many people’s agencies and offices to see what they were doing and to talk to people myself. I didn’t just leave it to whoever was the head of that agency or that department. And so it was a different way of handling, but we had to play hardball many times to get things done. Because we had lived with a lot of shucking and jiving for so long and I was not the one to be shucking and jiving. I didn’t come there like that and I wasn’t going away like that. Jonathan Movroydis: You have the rare distinction of being publicly saluted, honored by the President of the United States. It was at a dinner in your honor. Could you tell us the story about how President Nixon did that? Robert J. Brown: Well, there was a large group of people in Washington in different organizations who wanted to honor me when I got ready to leave. I’d been here almost four years, and so they had this big dinner, several thousand people at the Washington Hilton Hotel and the President found out about it. I didn’t tell him. But I think some of the staff…I know some of the staff… He found out about it because there a lot of stuff in the newspaper about it. You know, he never said to me that he was coming. No, I had seen him and he said, “Bob, congratulations,” but he never said anything about he was coming. So the night that we were having the affair, my grandmother was there and half the Supreme Court, much of the cabinet, and luminaries like Jackie Robinson and Vernon Jordan, and some Supreme Court, members of the United States Senate and the House, and other top people, business people that I had worked with and I knew. So somebody whispered to me that there was a lot of Secret Service on the premises. They were all over the place checking out everything. And I knew then, I said, “Secret service doesn’t show up like this unless the President is coming in.” I mean, they’d never show up like that unless the President is coming in. So after a while, about…I guess it was like 40, 50 minutes into the program, in walks President Nixon on the stage. And he just took over everything. The place was in pandemonium because nobody really knew that he was going to be there. He had said he had other things to do. He had sent a nice letter and praised me about what I had done and all that and then he shows up. And the place breaks into pandemonium. And we had a lot of celebrities there. Like Sammy Davis Jr. was orchestrating. You had many senators and congressmen and cabinet and everybody else, lots of entertainers. And the place just went into pandemonium when he showed up. And he walked up, he came up to the mic and he started speaking. And he spoke about my grandmother and then my grandmother got up and hugged him. And he spoke about me and what I had done and our relationship and where the country was going and he was so happy to be there and all that. It was an unbelievable night. There were thousands of people there, black, white Mexicans, there was just a cross section of America and it was great. I was so pleased and humbled by the honor that was given me. And I thank God for that. Jonathan Movroydis: Mr. Brown, what do you think Richard Nixon’s lasting legacy is? Robert J. Brown: I think his legacy will be about the fact that in many instances he was a visionary. For instance, we didn’t have a lot of different agencies and a lot of government policy that dealt with the environment for instance. We never had anything like that. He created that kind of thought and those kinds of processes and agencies within the government. The Environmental Protection Agency, you know, all of that kind of thing. None of that happened with the United States government or the world for that matter in top government circles until Richard Nixon started that in the first year of the Nixon administration. There were many other things like the environment that he was the forerunner. He made those things happen in the Nixon years. And I think America owes him a debt of gratitude. Nobody had ever put the kind of emphasis on employment, employment of blacks and giving blacks and other minorities opportunities to have businesses and businesses where they could go and get government work just like other companies all over America do all the time. President Nixon opened that up. There was never any kind of emphasis on that before President Nixon. And so there were many, many other instances. The military, up until President Nixon was President of the United States, there was never any kind of emphasis on making sure all the doors were open to all minorities to go all the way up to the top in the military. For instance, when President Nixon became President we had two flag officers, black. And one of them was about to retire. And so before he left office, there were so many you didn’t even know who they were. You couldn’t count them. I’m talking about generals and admirals. Nobody ever even gave a thought to that or spent two minutes trying to deal with that before Nixon. There were other kinds of things where he was the first President ever to even get involved with it, opening doors for blacks at every level in major corporations. Opening doors for blacks at every level of our government. Making sure that blacks had the same kind of opportunity to get government contracts for all kinds of things that they were qualified to get. None of that had any emphasis except when Nixon started that, when President Nixon started that in 1969. He was the guy who was the forerunner and who led the charge and everybody else has just been falling in line. Sometimes when you get another President, they want to go backwards on the things that Nixon brought forward. So you got to be…antenna has to be 10 miles high all the time to make sure that all of the American government is serving all Americans. That’s we have to be about. Jonathan Movroydis: Our guest today is Robert J. Brown, former Special Assistant to President Nixon. Our topic was his remarkable new book, “You Can’t Go Wrong Doing Right: How a Child of Poverty Rose to the White House and Helped Change the World.” Mr. Brown, thank you so much for joining us. Robert J. Brown: Thank you for the opportunity. Jonathan Movroydis: Please check back for future podcasts at nixonfoundation.org or on your favorite podcast app. This is Jonathan Movroydis in Yorba Linda.